Apply mask to skin and smooth to fit comfortably. Leave on for 15 minutes, then peel off and massage remaining serum into skin. Luminous Dewy Skin Mask is rated 5.0 out of 5 by 26. Rated 5 out of 5 by westtiff from it feels so nice! got this in a boxy charm box and finally tried it. I LOVE it so much. it is hydrating and smells so good. What I like the most about it is that it feels nice, it doesn't feel synthetic or burn. I find some of the masks I have gotten in my boxes, unless they are on the more natural side, burn and feel uncomfortable on my skin. I have to force myself to leave them on for 15 minutes. But with this mask, it was like a breath of fresh air, my skin certainly enjoyed it and I didn't count down the minutes and feel the "need" to take it off my face. I am going to purchase a 4 pack now :) thanks TATCHA for yet another fantastic product. Never waiver, always keep your purity promise. Rated 5 out of 5 by Grammie Cheryl from MY FAVOURITE I just used the Tatcha Luminous Dewy ‘Skin” Mask. I have tried many masks. This one delivers. The results are exactly as advertised. My skin looks luminous & dewy and feels soft and plump. I have mature somewhat dry skin. I highly recommend this product & I will definitely be repurchasing. This is my favourite mask...no doubt. Rated 5 out of 5 by yogigirl from Hydration, Hydration, hydration... I love this mask it delivers results! It makes your skin look as if you drank a gallon of water over night. Rated 5 out of 5 by Anonymous from AMAZING PRODUCT!! I bought two of these and used them both. After only using twice, a was difference seen! My skin is softer, brighter, my tone is much more even now as well. Can't wait to buy more!! Thank you for such an amazing sheet mask! Rated 5 out of 5 by AngelesMa88 from Just... Wow! Hydration Plus I used it and I swear as soon as you put it on you can feel the hydration. Super hydrated you almost never want to take it off. Soo refreshing, I love it!!! How often can this mask be used? The Luminous Dewy Skin Mask can be used as needed; we would recommend using it once a week. The sheet itself is a one-time use. Is this sheet mask gluten free? Thank you for your question! This mask is not among our options that are free of ingredients derived from wheat or gluten. For a complete list, please email our team at info@tatcha.com. How often should I use this product for best results? Thank you for your question! You can use this mask as often as you would like. We often recommend at least once a week to maintain a beautiful, luminous glow to skin. We hope this helps! Great question! We recommend cleansing your skin prior to using any mask treatments. For best results, try cleansing first and apply The Essence before the mask. After usage, massage a light layer of your favorite moisturizer. We hope you enjoy this treasure! Where in my routine does this fit if I use the Luminous Dewy Skin Night Concentrate? The Luminous Dewy Skin Night Concentrate can be used daily. Once a week, for extra glow and hydration, the Dewy Skin Mask pairs beautifully with the Night Concentrate. Apply the Essence, followed bythe Mask, and then finish with the Night Concentrate. If the primary purpose of this mask is to leave a dewy finish, will anything I apply afterwards&mdash;skincare or makeup&mdash;take away the glow? If you use cream and liquid formulas, the finish from the Mask will continue to glow through. If need to set your makeup with powder, use as little as possible and finish with the Luminous Dewy Skin Mist which will help pick up the glow. 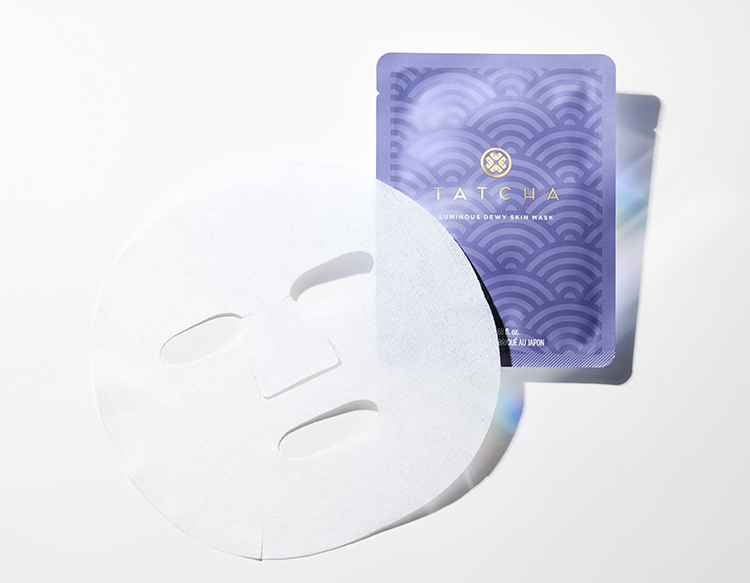 Would buying the tatcha water cream give me the same results as the luminous face mask ? Thank you for your question! We suggest using both. Use the Water Cream as your daily moisturizer for normal to oily skin to help balance hydration, minimize pores, and keep breakouts at bay. On days you want an extra boost of glowing moisture, apply this mask for 15 minutes. After, remove the mask and massage any excess serum into skin. Then finish with The Water Cream. We hope this helps! Hi - I would like to know what is the difference between Luminous Dewy Mask and Luminous Deep Hydration Mask? And when to use them?